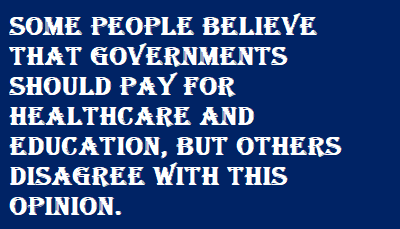 Some people believe that governments should pay for healthcare and education, but others disagree with this opinion. Discuss both views and give your own opinion. Education and health services are the pillars for the economic growth of the nation. The progress of the nation depends upon the quality of education and health services offered to their citizens. It is important to understand whether the government should pay for our healthcare and education or not. As per the survey was done by Frost & Sullivan, LSI Financial Services, and Deloitte, Healthcare industry is one of the largest sector providing revenue and employment in India. The industry is expected to touch USD 280 billion by 2020. So, we cannot say that healthcare should be made free for everyone. It is one of the major sector providing revenue and employment. Similarly, money is required in research for the development of the new medicine. The question is from where the money will come for research and development of the new medicine. As per the report from UGC Annual Report 2014-15, Technopark, Centre for Budget and Governance Accountability, the education sector in India is estimated to reach USD 144 billion by 2020 from USD 97.8 billion in 2016.The education sector is providing employment to millions of students graduating every year.Sometimes, the students passing out from premiere institutions leave for the jobs in the foreign country for better wages and settled there. So, providing free education in higher studies leads to the loss of national assets and brain drain. The constitution of India provides for free education for children between the ages of 6-14 years. The elementary education is free for the citizens. The underprivileged citizens are given free or affordable health services through various schemes of the government like National Health Insurance Scheme, etc. The tax base in India is very less than compared to the developed countries which are providing free education and healthcare services. This could be made free only in India when every Indian pays their taxes. So my point of view for the sustainable growth of the country there should be affordable health care and education services and not a free one.